In celebration of the Heal & Chill Event coming up December 2, 2017 in Durham, NC (get ur tickets!! ), we would like to announce the 20-Day Heal & Chill Challenge!!! Goal: Have a Zen Holiday! Everybody knows that the holidays can be full of drama and that we often over extend ourselves. So we are going to use this 20 days to implement healthy habits so we can heal and chill while enjoying the holidays. This will also be a good way to get a jump start on those New Year's Resolutions in which we promise ourselves we'll do better. Is it possible to have a Zen Holiday? Do you have what it takes?? Let's RECLAIM the holidays by RECLAIMING our time! And, yes, there are prizes. GOAL: "Have a ZEN Holiday!" 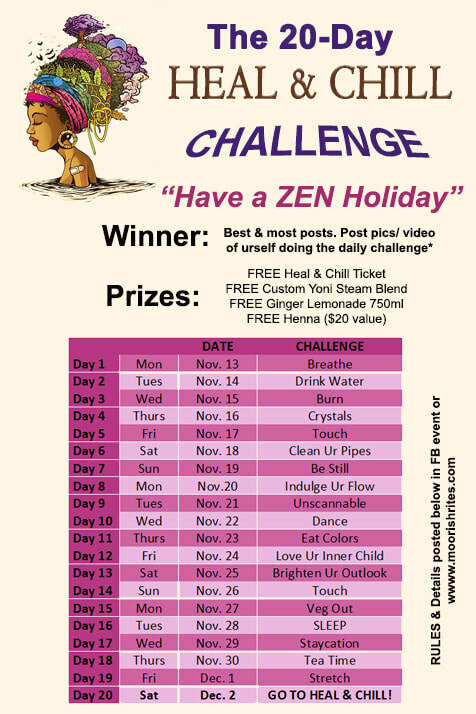 HOW: A Heal & Chill Challenge will be posted on Facebook every day for the next 20 days. Each day try to implement that challenge (healthy habit) into your day and post about it on Facebook in the Heal & Chill Event through video, photo, graphic, and or description. WINNER: You must be over 18 years of age to win and in the United States of America to win. YOU MUST SIGN UP BELOW TO WIN. JUDGING CRITERIA: There will be 3 winners. The winner is whomever posts for the most challenges. All posts must be within the Facebook Heal & Chill Event to count. We give more weight to video posts, then photo, versus just a written description. For example, if Tameka posted about her implementation of the daily challenge 12 days and her posts consisted of video and or photos and Veronica posted 5 different videos/photos (one post/challenge), then Tameka would be the winner. You may or may not have successfully implemented the challenge for a particular day, but as long as you post about your experience in attempting it. *We are NOT doctors. Please consult with your physician when implementing any health regimen.